same coverage multiple cameras used to provide – no matter what environment and is still able to deliver superior image and multiple views. The VMS is able to capture and display separate images from each of the sensors. Therefore, when viewing recorded or live video, it looks like there are 3 or 4 separate cameras but it is actually only one multi-sensor camera. 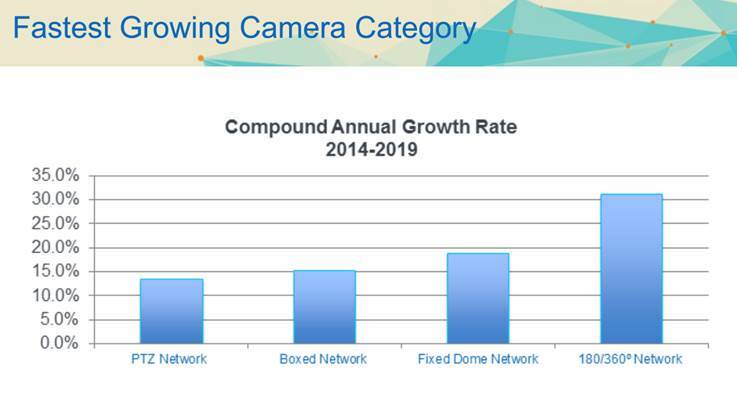 These cameras are gaining popularity because they reduce the cost for the end-user by lowering the cost of installation and increases long-term return on investment (ROI). 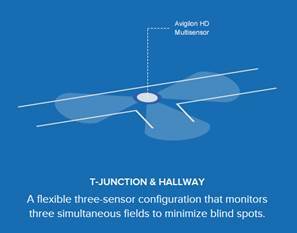 There are many different types of the 180 degree and 360 degree multi-sensor cameras which allow s the end-user to implement a solution that best fit their needs – whether it is fixed views or customizable views. While other cameras have fully customizable camera imagers that can be adjusted to view nearly any angle. 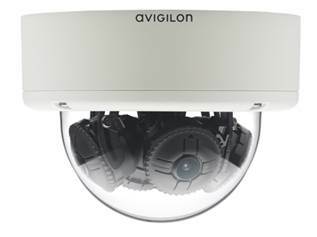 Below is a picture of a customizable camera from Avigilon. As you can see the imagers are on pivot and adjustment brackets allow for fully customizable installation. The video view will look as though there are three or four cameras. 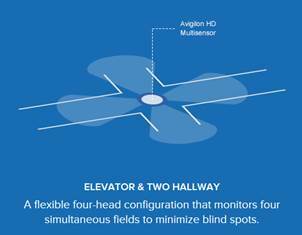 These cameras ensure that the coverage can be tailored to fit the end user’s needs. The below is an example that shows an interior “T” intersection hallway, which again can be covered by with one camera. In the below example the interior hallway intersection or an elevator lobby which used to require 4 cameras to cover this location – now only needs 360 degree camera. 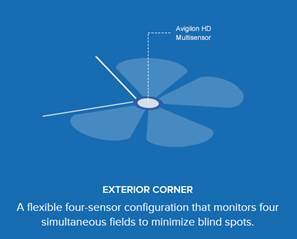 In this example the exterior of this building is being covered by one four-sensor camera configuration that monitors four simultaneous fields. This example of interior corner coverage is captured by a flexible three-head configuration that monitors three simultaneous fields with minimal blind spots.